If you’ve been following along with me for a while, you may know that I’m obsessed rosé. Some may consider it a summer sipper… Me? I drink it year round. 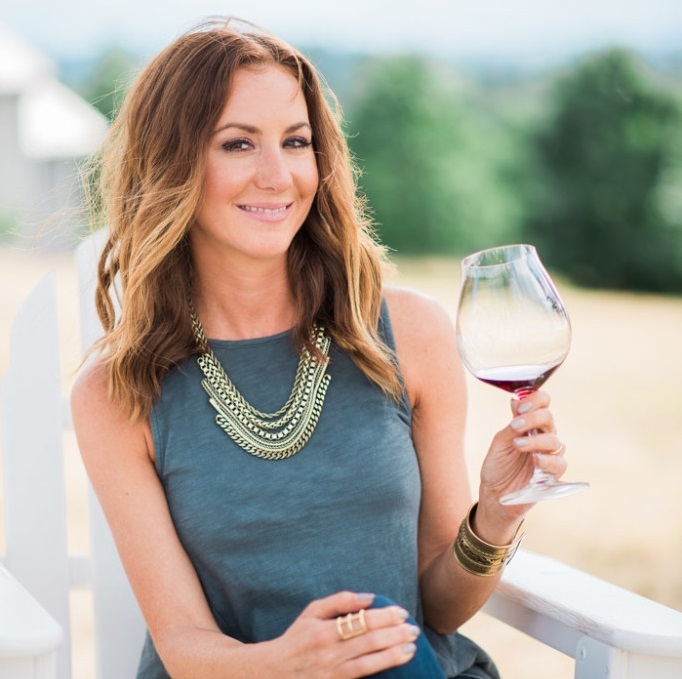 I love that it’s food-friendly, easy on the wallet (here are some of my favorite rosé wines under $10), and that it comes in all shades of pink. Some hit you with more acidity right of the bat, others are more full-bodied and rounded, and some even have a bit of effervescence to them. I’ve got a sweatshirt that I wear around the house boasting my love for the pink stuff, and I’m highly considering gifting myself with these espadrilles that fully sum up my obsession. Up until now, I’d never even thought about cooking with rosé. I mean, it’s probably because I didn’t want to spare even one sip… But then I caught this recipe in Food & Wine that instantly had me rethinking things. Chef Jennifer Carroll had the genius idea to grill up some swordfish and serve it with a rosé wine mayonnaise. It makes sense really. Rosé wine is much like a white wine that you’d want to use in cooking – Unoaked, with a good bit of acidity, and some body to it too. I immediately had to run to my local Fred Meyer to pick up the ingredients to make this yummy dish. I made a few tweaks to her recipe – shortening the marinating time, upping the acidity in the rosé wine mayonnaise, and swapping out some of the ingredients she used to make a fennel & olive relish for those that I’d prefer in a salad – Radishes, avocado and fennel, tossed together with some tender Simple Truth organic baby spinach. Of course, even with my changes, I definitely have to give all the credit to Chef Carroll for this amazing recipe and the light bulb moment that got me thinking that I need to start using Rosé wine in recipes much, much more. 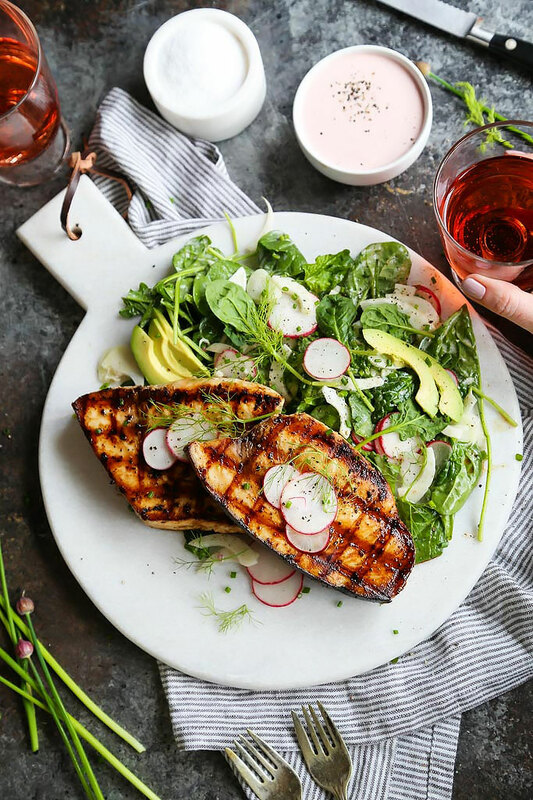 This Grilled Swordfish with Tangy Rosé Wine Mayonnaise is perfect for al fresco dinners on warm summer nights. The crisp, cool salad is the perfect compliment to the meaty swordfish and that wonderful rosé wine mayonnaise. As an added bonus, the cork is already popped on that bottle of rosé. Pour a couple glasses to sip alongside this delicious grilled seafood dinner. In a small bowl, whisk together oil, lemon zest and lemon juice and season with salt and pepper. Pour over swordfish and allow to marinate while you prepare the other ingredients (up to 1 hour). Bring the rosé wine to a simmer in a small saucepan and cook until it has reduced to 2 tablespoons, about 10 minutes. Transfer to a medium bowl and let cool to room temperature. Whisk in shallot, rice vinegar, lemon zest, lemon juice, garlic and mayonnaise until smooth. Season with salt and pepper, to taste. In a small bowl whisk together 1/3 cup of the rosé wine mayonnaise with the oil, rice wine vinegar and lemon zest and juice. Season with salt and pepper, to taste. In a large bowl, combine fennel, radishes and baby spinach. Toss with dressing and top with avocado, chives and fennel fronds. Heat your grill to medium-high heat. Remove swordfish from marinade and grill, turning once, until cooked through and flaky, 3-4 minutes per side. 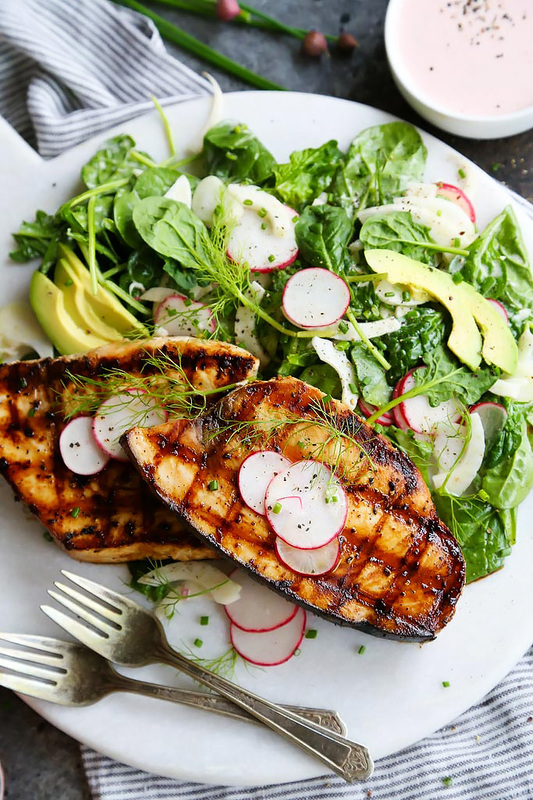 Serve the grilled swordfish alongside the salad and with remaining rosé wine mayonnaise. 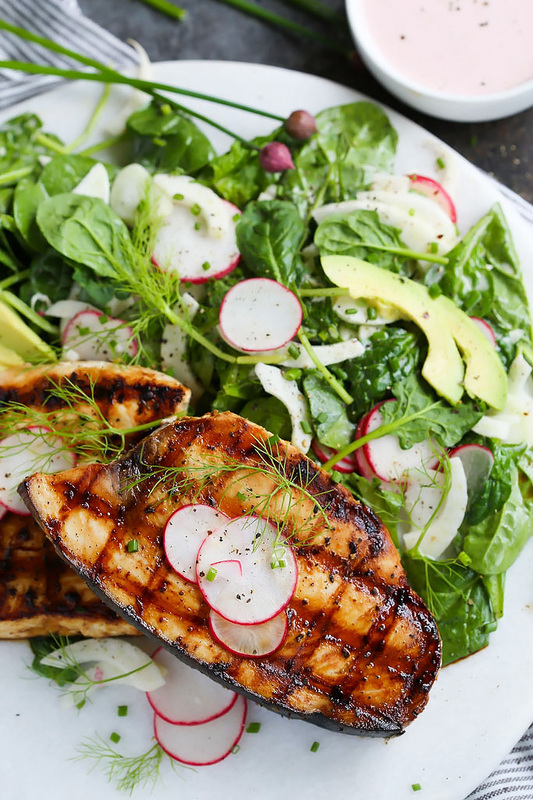 Go ahead and serve the Rosé that you used for the mayonnaise alongside this grilled swordfish. It’ll be the perfect compliment. Want to open another bottle? An unoaked Chardonnay or Viognier would also be fantastic with this dish. They have enough body to stand up all the flavors in this dish but won’t overpower the mild swordfish. Hosting guests, or just feeling festive? Bubbles would also be amazing! Try Cava, Prosecco or a Brut Rosé. Wow, this sounds (and looks) as if it came straight out of a restaurant. Yum! What an absolutely gorgeous meal! Perfect for summer…looking forward to trying it! I’ve never made swordfish at home but I love swordfish and this looks amazing! I hope you enjoy Marlynn! What a beautiful dish! …Looks like the perfect light summer meal. Can’t wait to try it! Thanks Sara – It’s the perfect meal for enjoying on the patio! This is such a gorgeous plate! I love everything that’s in it! It is indeed a perfect summer meal! Thanks Sanna! I agree – It’s a perfect meal for the warmer weather! Amazing recipe, Looks so tasty! Yummy! As always your recipe sounds absolutely delicious! I can’t wait to try the Rosé mayo!! Thanks Kathryn – I’m am thinking up more and more ways to use that Rosé mayo – SO good!